So yesterday ET and I both had the day off. I was bit hungover, but when ET called me in the morning and said we�re going fishing, I had no choice but to rally up and get going. After all, as ET put it, "It�s better than staying home and watching tv all day." 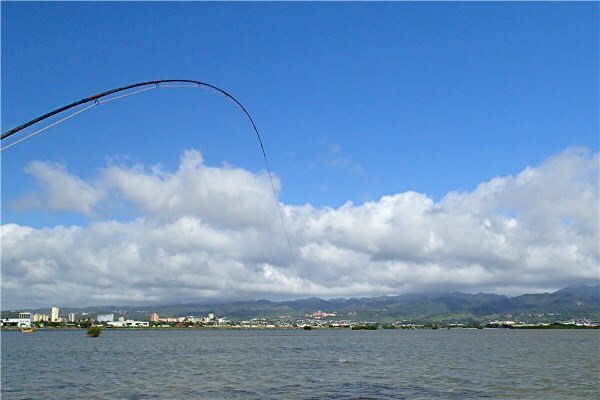 True enough, and so off we went to Keehi Lagoon. I should point out something at this point. 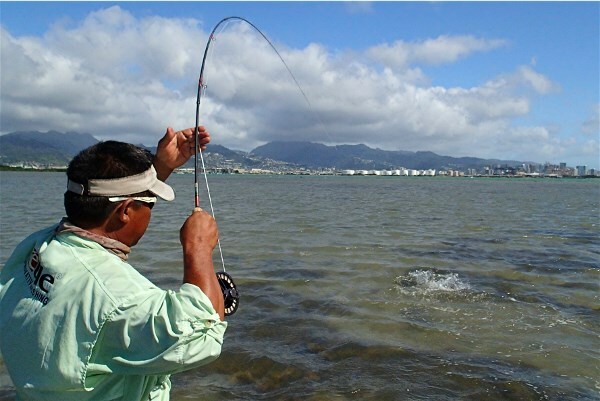 The (in)famous "Triangle Flat" in Keehi Lagoon is one of the most challenging and difficult places to hook a big fish in Hawaii. 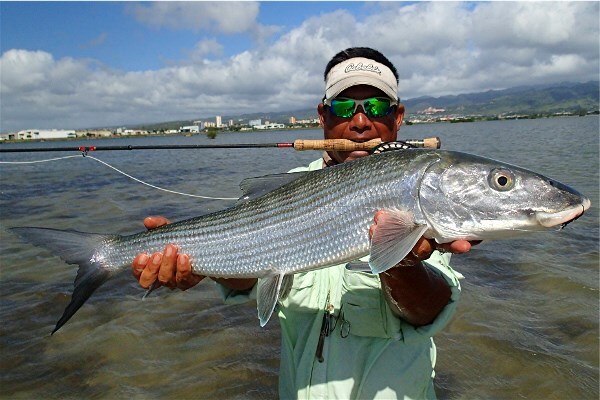 The fish are residents of the harbor area and don�t leave the safety of the lagoon. This was proven by my friend Jarod, who earlier this fall hooked the same fish twice, two hours apart (another fish story for another day), and the fact that I caught a tagged fish yesterday whose tag had broken off leaving just a nub. But I digress, the point is that the triangle fish are fussy, spooky, and as uncooperative as you will find anywhere. The little ones might jump readily on a fly, but the bigger ones can drive you crazy. 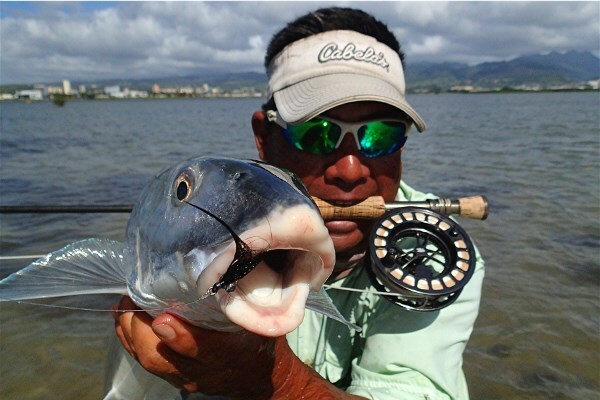 Which means that hooking a really big one in the shallows represents an accomplishment, even for a seasoned angler. So because we didn�t have much of a game plan (and did I mention I was hungover? ), ET and I fished closer together than we normally would. 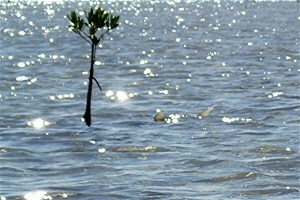 As it approached noon the water started to flood back into the shallow mangrove zone in the middle of the flat. 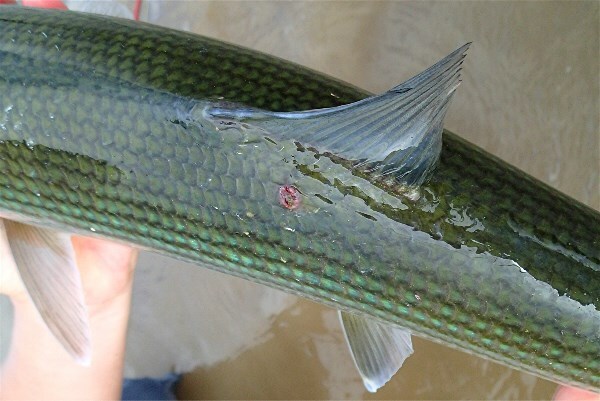 We started seeing tails popping up here and there, but being typical triangle fish, they often swam away before we ever got in casting range. Then I saw a big tail waving around about fifty yards from where we were standing. More as a joke than anything serious, I told ET, "Go catch that fish. I want to see you hook him. I�ll just take pictures." I say this was a joke because fish of that size in ankle deep water will almost never give you a proper shot, much less eat a fly. 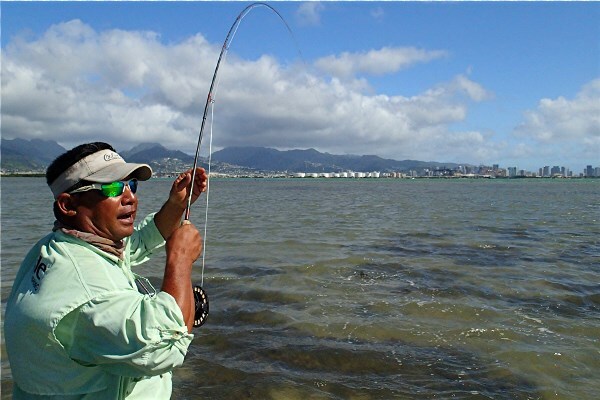 But I wanted to see the approach that one of the most seasoned fly fishermen on the island would use in this situation. I stayed about 30 feet behind ET while he slowly crept up on the fish, whose back was half out of the water while it wallowed and dug around in the mud and seaweed patches. I only stepped when ET did, and ducked when necessary to avoid getting a hook stuck in my ear. We got within about forty feet of the fish, and I got to see ET do what only he seems able to do. As the fish gradually moved left to right and slowly toward us, ET threw his fly over thirty feet to the left of the fish. 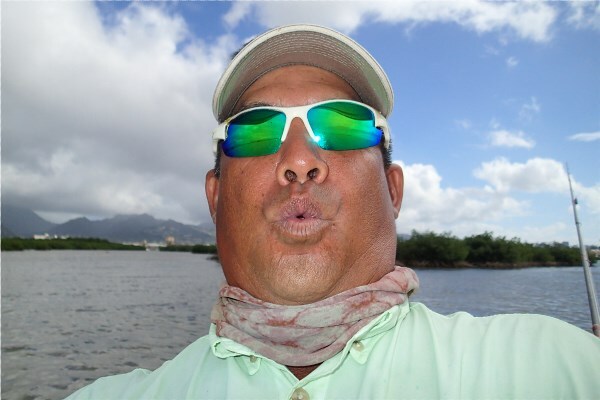 Now, I have fished with a lot of Hawaii�s veteran fly casters, some of the top guides on Christmas Island, as well as industry folks who can really sling a line, but I have never met anyone who innately seems to know where a fish will go better than ET. So when the fish turned and started to swim directly at us, my first thought was to pick up the line and recast quickly in front before the fish realized we were there. Not ET, he stripped the line in about two feet and left it there. And sure enough the fish made a hard turn back to its left and in just a few seconds swam within a few feet of the fly. ET did a single slow strip and fish rushed over and inhaled the fly. At this point I should mention that ET�s fly du jour was a hairy mess of bucktail and v-rib lashed to a hook with monofilament thread. A grand example of the fine art of fly tying it was not, but ET didn�t seem to care and neither did the fish. The fish didn�t run far, the big ones never do, but it kicked and thrashed the water to a froth all over the flat. I was a little worried that it might spit the barbless hook splashing around and changing directions, but ET kept the tension steady on the line and before long the fish was at hand. While ET played the fish he told me that the direction the fish was moving in was obvious. When it turned towards us, it was just "trying to throw us off." When he finally tailed it we realized it was close to three feet long and the biggest fish either of us had pulled off of this flat in a very long time. A few quick snaps and it was back on its way. After it was all over, I repeated to ET what an incredible experience that was for me to watch. 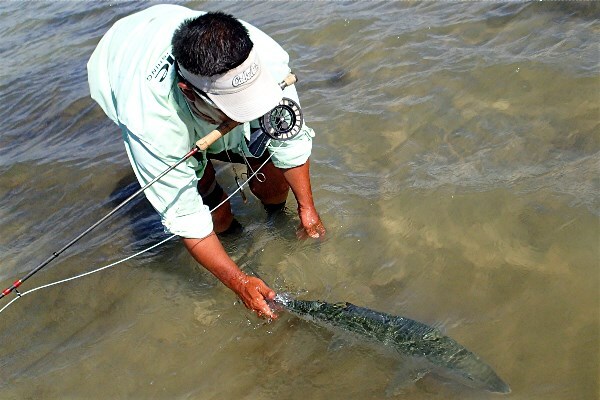 The long distance stalk, the cast way out to left field, and the confidence not to move the fly when it seemed the fish was changing direction. I could never have put all that together. I have forgotten the details of most of my catches over the years, but I know I�ll remember this one for a long time. He replied, "I just got lucky. Or maybe you just need a better fly!"